Synopsis: The time is 1999 and the place is a New York City which has evolved with the benefit of science heroes. Anti-grav cars prowl the streets and flying vehicles patrol the skies with searchlights. The skyline is filled with garish neon signs advertising the latest and greatest consumer products. It is a time of technology and capitalist reasoning. Sophie Bangs is a college student struggling to dig up material for her research paper based on a fictional character called Promethea. Her best friend Stacia mocks her relentlessly for choosing such an obscure subject before skipping off to a rock concert. 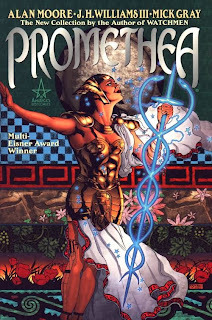 Sophie is utterly fascinated by the apparent myth of Promethea - a figure referenced in 18th century poetry and later given the spotlight in pulp comics. She attempts to interview Barbara Shelley, the wife of the last publisher of the Promethea comic book, but gets shut down. Barbara gives Sophie the cold shoulder and issues a cryptic warning: "You don't wanna go looking for folklore. And you especially don't want folklore to come looking for you." On her way to meet up with Stacia, Sophie is attacked by a strange shadow-creature who defies reason. At the last second she's saved by a woman dressed in oddly Hellenistic attire. She explains the history of Promethea, but gets severely wounded by the creature. Somehow Sophie is able to harness the power of Promethea and saves the day, but what is the price of her newfound abilities? 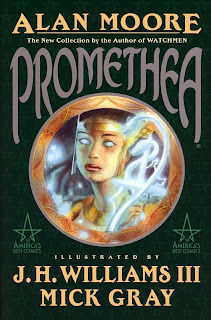 If Promethea is an idea then can an idea overtake a person's will? Sophie grapples with a reality mixed with mythological concepts. 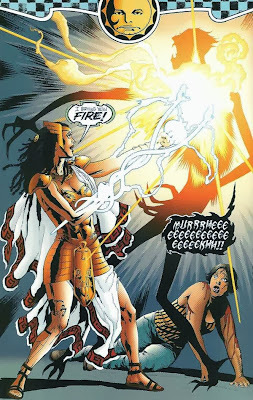 It seems Promethea has garnered many enemies over the years and they begin coming out of obscurity to test Sophie as the latest incarnation. In her naive state can Sophie survive their attacks? The shadow-creature was just the beginning as demons, storybook characters, and a rogue magician come after Sophie. Promethea resides in a strange realm called the Immateria where everything is malleable as fictional ideas dictate reality. Cons: The Immateria seems a bit like The Dreaming (the realm of dreams) from Neil Gaiman's The Sandman, Sophie's plight takes a backseat to exploring the origin of several past incarnations of Promethea, this volume is purely setup for more stories to come and I'm wondering if the entire series will be like this? Mike Tells It Straight: Alan Moore's Promethea has garnered a lot of praise and artist J.H. Williams recently finished a smoldering run on Batwoman. 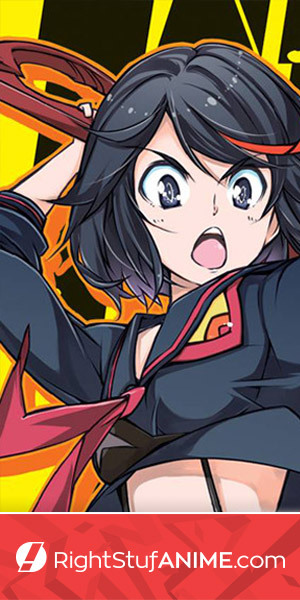 This series has a lot of hype attached to it and I finally sat down with the first volume to give it a thorough reading. 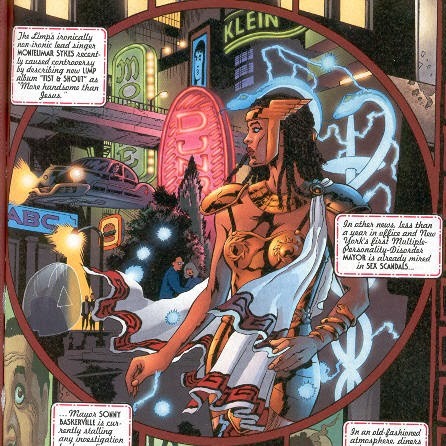 The first six issues essentially set up the foundation of the series by introducing the history of Promethea and having Sophie become the latest incarnation. We are taken to the Immateria and given the origin of Promethea along with meeting all of the previous incarnations. It's a somewhat high concept character and reminded me of James Robinson's Starman mixed with Neil Gaiman's The Sandman. 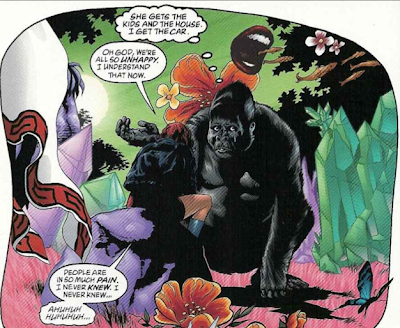 Williams art is great with intricate panel designs and nice use of shadows. His work reminds me of Tony Harris (Starman, Ex Machina) and I can definitely see a lot of potential in this early work (similar to John Cassaday's early work on Desperadoes). 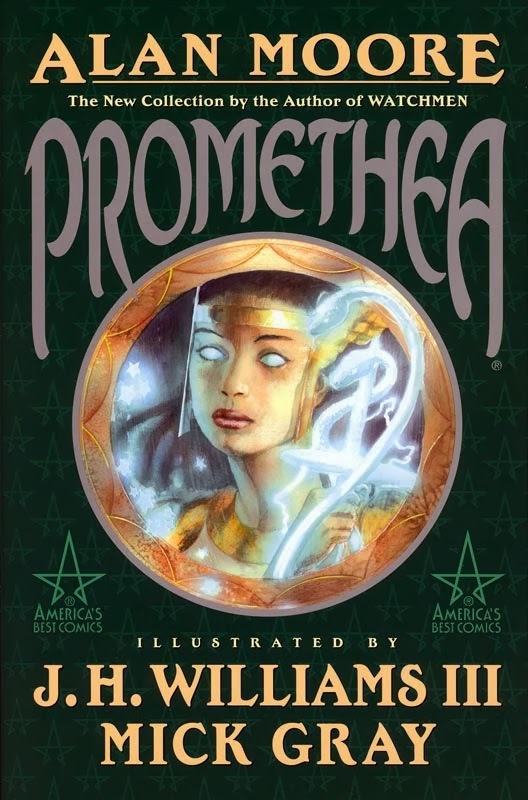 Promethea was chosen as the second series to be reprinted as an Absolute Edition (after The League of Extraordinary Gentlemen) from Moore's America's Best Comics line. I definitely attribute this fact to Williams' rise as a prominent artist. The plot had some cool concepts and I was glad to see something outside of the traditional/mundane superhero fare, but I didn't think the work was quite as profound in this first volume. I would have liked less high concept and more focus on Sophie as the new Promethea. I'm not looking forward to more trips to the Immateria and felt revealing all of the past incarnations was premature. A slow reveal would have given them more impact and diversity. 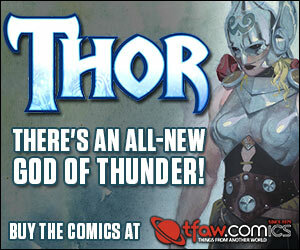 I do like the mature aspects of the story and mythical elements. It was a complicated first volume and garnered enough of my interest to check out the next one.